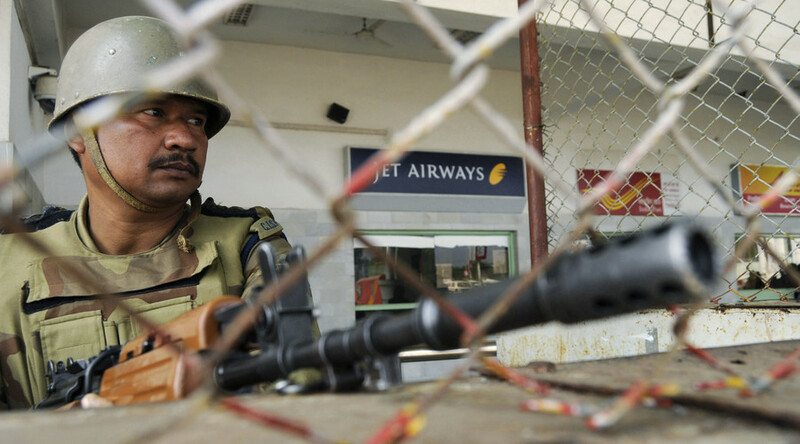 An hours-long gun battle raged at India’s Pathankot Air Base in the northern Punjab state after armed men stormed the facility. Three Indian troops were confirmed dead, and four terrorists were killed in the shootout with Indian security forces. The operation to secure the base has now ended with all the terrorists dead, according to the police, as cited by AFP. The initial gun battle between security forces and the terrorists ended several hours after the attack began. Four of the attackers were shot dead, the Times of India reported. It has been confirmed that three Indian Air Force personnel were killed in the attack, and six more soldiers injured. However, there had been reports of fresh gunfire at the air force base. At least one helicopter could be seen firing shots, while there were also reports of gunfire inside the perimeter of the base, according to AP. The armed assault was launched at 3:30 am local time (22 pm Friday GMT), according to the NDTV agency, citing local authorities. The assailants reportedly used a police vehicle, stolen a day earlier, and were dressed in military uniforms to get into the base. The terrorists, believed to be from the Jaish-e-Mohammed terrorist group, entered the living quarters of the Pathankot Air Force base, which is situated some 430 kilometers north of the capital, New Delhi. 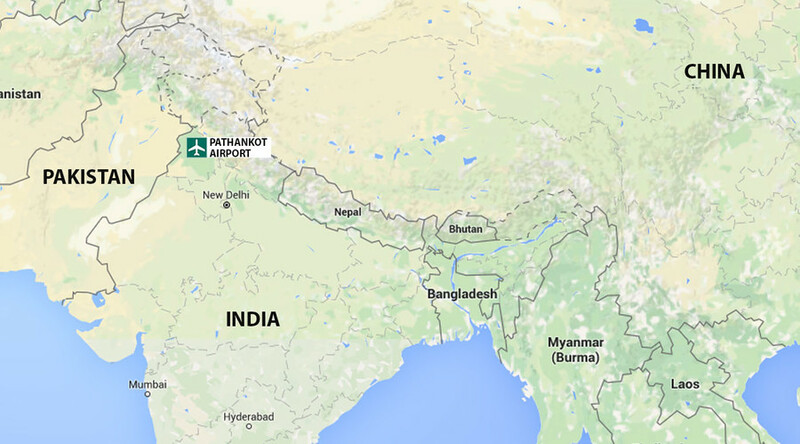 The Pathankot airfield is close to the Pakistani border, and straddles the highway connecting India's Muslim-inhabited Jammu and Kashmir state with the rest of the country. The attack resulted in a fierce gun battle with Indian security forces, which blocked the gunmen in an area inside the base. Although there are Indian MiG-29 fighter jets and helicopters stationed at the location, none of them could be reached by the attackers, according to officials quoted by NDTV. Up to five terrorists stormed the facility, local news agency Asian News International (ANI) reported. According to ANI, the Indian troops sent for reinforcements, including helicopters. "The gunbattle between terrorists and security forces ended after more than five hours," the Times of India quoted Punjab Police ADGP (Law and Order) chief H S Dhillon, as saying. "However, the area was not sanitised yet, and the [manhunt] continues," Dhillon added. Defence Minister Manohar Parrikar to hold a high level meeting on #Pathankot attack with security officials in the evening. Meanwhile, the assault has been linked to an earlier attack in Punjab on Friday, in which five armed men with “heavy weapons” ambushed the SUV of the local police chief. According to The Indian Express, three people, including the policeman, were kidnapped at gunpoint but later released. An apparent murder of a taxi driver in the area has also been linked to the attackers. While no group immediately claimed responsibility for the attack, similar attacks have been carried out in the northern Indian state by militants crossing into India from Pakistan. In July, three terrorists armed with AK-47s and grenades attacked a bus and a police station in Gurdaspur district. Three civilians and all of the attackers were killed after a 12-hour shootout with the police. The attack comes days after Indian Prime Minister Narendra Modi’s surprise visit to Lahore, Pakistan on December 25. The move was warmly welcomed by Pakistani Prime Minister Nawaz Sharif and has been viewed as an attempt to mend ties between the two historic rivals. The territorial dispute over the northern region of Kashmir has resulted in three major conflicts between India and Pakistan since the Partition of India and the creation of Pakistan in 1947.